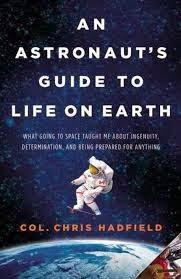 An Astronaut's Guide to Life on Earth by Chris Hadfield was a fast and interesting book from someone who I first heard about from his rendition of David Bowie's Space Odyssey song while on the International Space Station (with the video now at over 20 million views). What struck me the most from the book was the detail about training simulations of almost every scenario that could possibly occur, including death simulations so everyone would know in advance the steps to follow should an astronaut perish. As the Challenger and Columbia Space Shuttle disasters showed, space travel has enormous risk and Hadfield writes of identifying and training for worst case scenarios so an astronaut's reactions to them can be immediate. A couple of specific phrases used in the book are "flight rules," the non-negotiable things that are done when certain situations arise as well as practice of thinking "what's the next thing that could kill me?" during especially the most dangerous portions of space travel. Related to the training and how involved it was, I found interesting Hadfield's comment that he didn't view training for something as solely a stepping stone, but rather tried to view it as an end in itself, especially since situations trained for might never arise. This approach was especially relevant in terms of space travel as being selected for a given trip was someone that would only happen to a few people within the community of astronauts. Also interesting in this regard was how the astronaut program built with such a flat hierarchy, someone might go to space, then spend years supporting others who do and then later go back, or perhaps never get a return trip. In Hadfield's particular case, he did get one last trip into space prior to retiring and there's a lot of interesting material in the book about his months spent on the International Space Station, violence of the capsule re-entry back into Russia, and subsequent physical toll on his body of that time in space. As Hadfield wrote, the effects of prolonged space travel on the body's systems closely resemble the effects of aging, and part of the research by the various space agencies was to study astronauts after their return to earth. There were parts of the book that I found not as interesting as others, but I was able to read the whole thing in three days and all in all, I enjoyed it.